Private wetlands access on the Big Creek Flyway – Urich Missouri Wetlands. A micro flyway of the Mississippi Flyway with a long past history of market hunting. Private duck clubs predominate this area. Waterfowl hunting options are largely limited to hunting with a duck club. Or, our Association gives you this duck area as well as many more for much less the cost than any one of the single wetlands clubs in this area. The difference between theses expensive unguided duck clubs and ours is we do not maintain an expensive lodge. 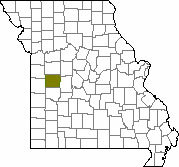 This area is an hour’s drive from Kansas City, Missouri. 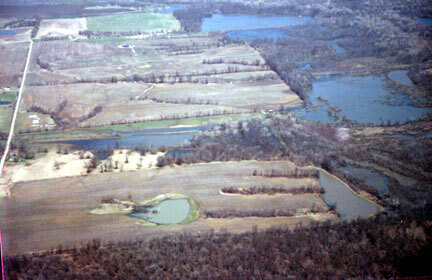 Our Big Creek Missouri waterfowl hunting is pictured at the bottom of the picture at right. The slough in the aerial. 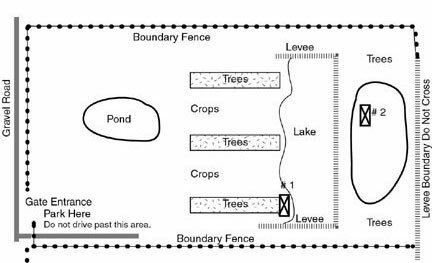 Dry land access to the duck blind. Waders are only required to retrieve game and put out decoys. 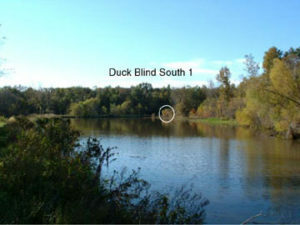 Looking to the blind’s front from the far shore showing the shooting pool. 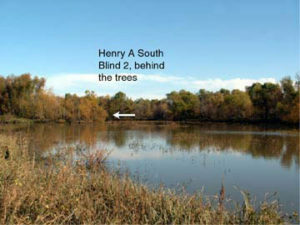 Below, from the south end of the lake looking back to blind 1 shown in the white circle. 10 total surface water acres. 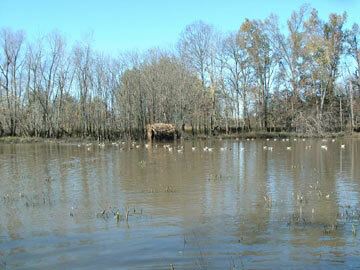 This waterfowl area has had adequate water to hunt, even during severe drought years, since it was constructed in 1985. The water source is a combination of run off and overflow from Big Creek. Dry land access to the blind depending on the water level of Big Creek. 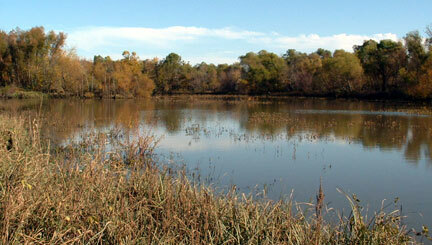 The water level of this 10 acre slough fluctuates from as the picture below shows to the floor of the blind. Chest waders are recommended. Same blind in both pictures. The below view is taken from the south of the slough facing north. This 80 acre Missouri farm was originally scouted to lease for quail and deer hunting the summer of 1982. 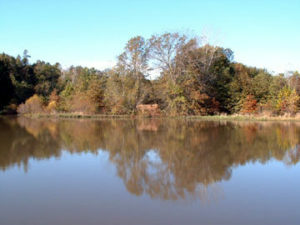 The landowner told the club the east 20 acres flooded due to a log jam on Big Creek and at times, duck hunting could be a bonus to the lease. We hunted the slough for 2 years as a wade-in area and discovered it’s potential as a prime spot for waterfowl hunting development. Since the slough was too wet to access a dozer we spent several hot summers clearing brush with chain saws and burning the brush piles to keep as much open water as possible. Fortunately, the summers of 1988 and 2003 were dry enough to allow a dozer to work for 2 days to finish off and groom the work we did by hand. 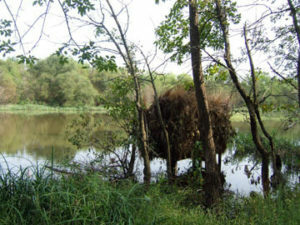 The blind has been place in the northwest corner of the slough under a grove of mature oak trees facing Big Creek. Blind 2 has been a consistent waterfowl producer over the years both early and late season. Viewed from the far side opening weekend of Missouri's middle waterfowl zone.